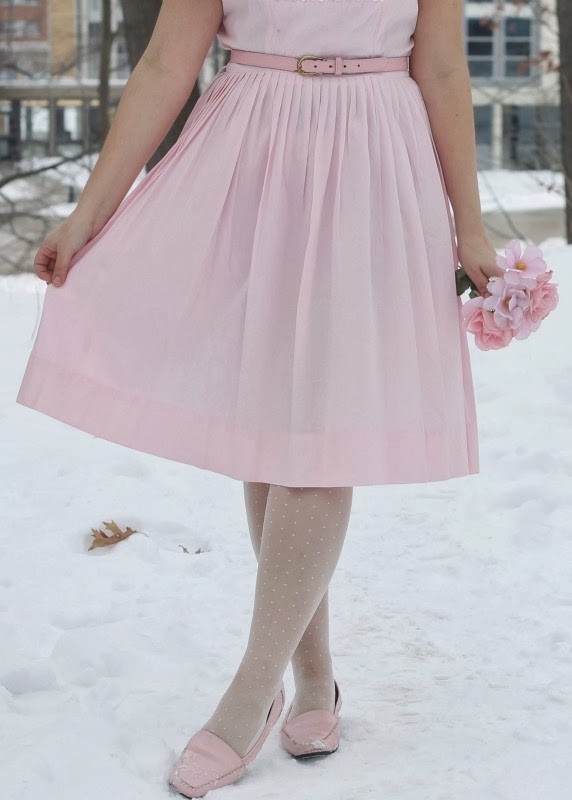 Vintage Pink 1950's Dress: The Bomb Shelter in Akron. Pink Loafers, Earrings, Belt: Thrifted. Lipstick in MAC's Please Me with Smart Bomb Lipgloss in Super Freak. The sweetest day of the year is finally here and I'm over the moon excited. I've been counting down the days! Valentine's is just a beautiful holiday. I am so full of joy seeing all of the love in the world through all of the social media posts, happenings on campus, and even in my own life, too. I received a surprise little package yesterday from my family in the mail. It was filled with Valentine's Day goodies and sweets, and I was so overwhelmed with gratitude towards all of them. They love me so much it's unreal and I feel like such a lucky girl who's so incredibly undeserving. It stinks to not be able to see them today, but I'm greatly looking forward to going home next weekend for my father's birthday! I've also been waiting a good month to wear this dress. I wanted its debut to be special, and it can't get any more special than Valentine's Day! I love it to pieces and feel so pretty in it--can't wait to have lots of adventures with her this spring and summer. This evening I'm going out with some gals for Mexican food; it's going to be a real treat! I've seriously heard so many amazing things about The Bomb Shelter that I'm going to be taking a road trip VERY soon! This is the perfect debut for this adorable dress, and you look great in it! Happy Valentine's Day, sweet lady! You look so darling! Love this look from head to toe. sooo pretty! happy valentine's day! I ♥ reading your blog! Happy Valentine's Day!! I love this dress! It's perfect for today!! That dress is just so lovely and beautiful, just like you! I hope that you have such a lovely Valentine's Day and great weekend home with your family! Oh gosh Lauren, you looks SO beautiful :) Your hair looks amaaaazing, did you do this yourself? This dress is absolutely wonderful! 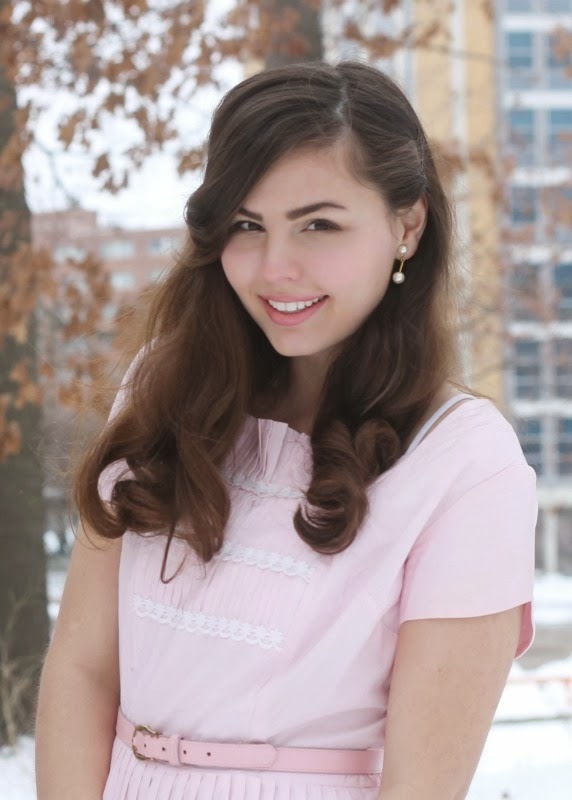 I just love that your Valentine outfit is full of light pink. It's adorable. I really like the ruffled detailing on the bodice of this dress and how wonderfully your shoes match the color of your dress. Super pretty. I hope your Valentine's Day was wonderful! Happy valentines day! That dress is impeccable! This dress is a DREAM and you look absolutely perfect. I hope you had a beautiful Valentine's Day, my sweet friend! Oh my goodness that is a beautiful dress!